I feel especially in the Christmas spirit having just finished A Christmas Carol. My poor husband and animals have had to put up with my belting out Christmas carols, and taking them for a spin around the house. While my husband and my dog Riley love to dance, the cats aren't quite so willing partners. I am not sure what to say about this wonderful story. It's one that is known the world over. I have seen the many movie versions (except for the latest animated film which just came out this year), most more than two or three times. It's almost a tradition to see the film at least once each year. I had never read the novella until now, however. It was exactly as I thought it would be; which is to say, if you've seen the movies as often as I have, you know the story well. I felt like I'd read the story before--but it didn't strike me with boredom. Rather it was exhilarating. I can see why so many of you choose to read this story every year. For those not familiar with the story, it is about a miserly curmudgeon of a man who has no love in his heart for Christmas. He believes in working hard and that's about it. He is hard on his employee and unkind to those requesting charity. He sees others as being greedy, lazy and no good. The night before Christmas, Ebenezer Scooge is visited by the spirit of his old business partner, who lived his life in much the same way as Scrooge when alive. Jacob Marley warns Ebenezer that he is destined to follow in his footsteps, bound by the same chains and suffering in the afterlife, if he doesn't change his ways. Marley foretells that Scrooge will be visited by three spirits, each one representing the phases of life: past, present, and future. And so the story goes. For Ebenezer Scrooge, the spirits were frightening as well as awe inspiring. He was overcome with everything he experienced and saw that night. Charles Dickens has never been at a loss for words as far as I can tell. In A Christmas Carol, he doesn't hold back on details, painting vivid pictures with words of the characters and scenery in the story. Nor does he write a completely serious tale, as serious as his subject matter may seem. There is humor mixed in as well as pageantry. I love the way he writes. Admittedly, it is hard for me to separate out the movies from the book as images from the movies kept springing to mind as I read. 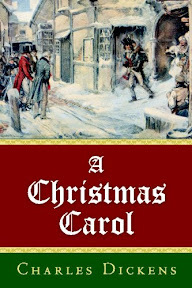 A Christmas Carol has become a staple of our culture. The lessons learned from it are ones we are all familiar with. The story has been told in countless ways over the years. Charles Dickens' tale is every bit a classic in that way. If you've only seen the movie, whichever version and incarnation, you really must read the story from which it came. Source: I found this gem in a used bookstore one day while killing time on a visit to the courthouse for jury duty. I couldn't tell you what year or month, only that I did buy it myself. I definitely enjoyed A Christmas Carol when I read it a few years ago! Merry Christmas, Wendy, hope you and your family have a wonderful holiday! I read this story each year with my 7th graders and never tire of it! I wish you and your family (and your pets) a very Merry Christmas, Wendy, and I look forward to reading more of your reviews in 2010! And to you! Have a wonderful holiday season. Believe it or not, but I've never read this story. I've never read anything of Dickens! I did order Great Expectations on audio from the library this past week though. Hope you and Anjin and the babies have a wonderful holiday! I've never read it, but I did listen to it on audio this year. It was narrated by Tim Curry, which was just about perfect! Merry Christmas to you and Anjin! I've seen many of the movie versions too, but don't think I've actually read the story. Maybe next year. Merry Christmas to you and your family! I suppose it's a sign of a great book when it has been ingested and regergitated in as many forms as a person can think of, including a musical version and the recent "Ghosts of Girlfriends Past". Like most Americans, I grew up with the story as a ubiquitious part of my Christmas season, yet I never read the actual book until I was an adult with children. I enjoyed your review, and have a Merry Christmas! I know this story so well i have never read the book, but I think I will next year. Merry Christmas, friend! I hope you have a wonderful holiday. I read this for the first time last year and adored it. But then again, I'm developing a bigger literary crush on Dickens with every book of his I read. It is hard for me to believe that I have YET to read this one! I've really got to get it together next year and read it at Christmas! Enjoy your holiday! Merry Christmas! Perfect time of the year to read that story....one of my favorites! It's been a while since I last read A Christmas Carol, but most years we try to watch Patrick Stewart's version of it at least once (we have it on DVD). Merry Christmas to you, Anjin, and the critters, Wendy! Merry merriment and joyousness to you this Holiday season and a blessed book-full new year! I'm so glad you liked the book. I read it for the first time this year and loved it so much more than any of the movie versions. Merry Christmas from mine to your, Wendy! Hope you have a fun but safe one! Dickens is my favorite author of all. Merry Christmas Wendy, to you, your hubby and your fur family. Have a lovely holiday season, whatever holidays you choose to celebrate! Yep my kitty is thoroughly sick of Christmas and Christmas dances too. You should hear Jim Dale read this! He does such a marvelous job! Thank you everyone for your comments and the Christmas and holiday wishes. It's been a very nice day. We got the cats a laser light and my husband and I are having just as much a blast with it as the cats. :-) Riley could care less, but then, he's got his own new toys to squeak around the house. Merry Christmas! I made my family watch the George C. Scott version of this last night and the day before I started reading it aloud to them but only got through Marley's spirit before I couldn't make them sit any longer. Even snowed in, they weren't that captive! I've seen the movie versions..even the Mr. Magoo version. I own the book and look forward to reading it. Great review. I love The Christmas Carol - I have it on audio read by Patrick Stewart. I hope you and your husband had a wonderful holiday! Merry Christmas to all of you too! I hope you are enjoying the weekend. 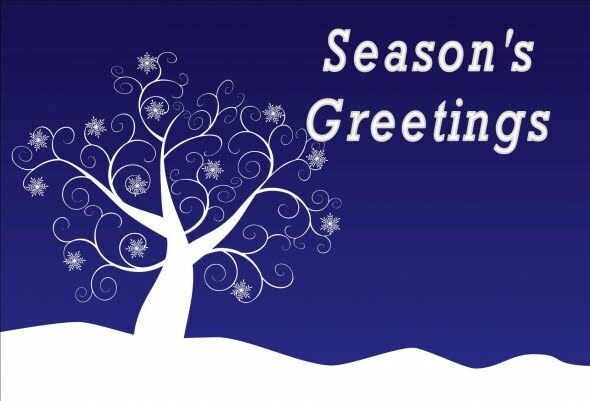 Seasons Greetings to you! I also love A Christmas Carol - I love hearing it read aloud. Every year we have a CBC Christmas Carol event in which a CBC radio personality partners with four readers from the community and holds a reading which raises money for charity. I organized it for a couple of years and it was such great fun. My town is home to a major theatre so it is easy to find excellent readers, too. Very enjoyable to listen to. I started this before Christmas but didn't finish it with everything going on so I've put it on the backburner until next December. Kudos to you for getting it finished before Christmas. I really enjoyed reading this to Kiddo this year - it's always been one of my favorites, but it was wonderful to share it with him for the first time. I read this one this year too. It was my first Dickens, but I loved his easy writing style and will have to try reading more of him.